My team of horses are all in great form and have all been picking up places at competitions recently and I’m immensely proud of them all. It’s always easy to say well done to someone for doing well, but having said that the only person who knows the real inside story on what you’ve achieved is yourself, and I think you’re only as good as the horse you’re riding. 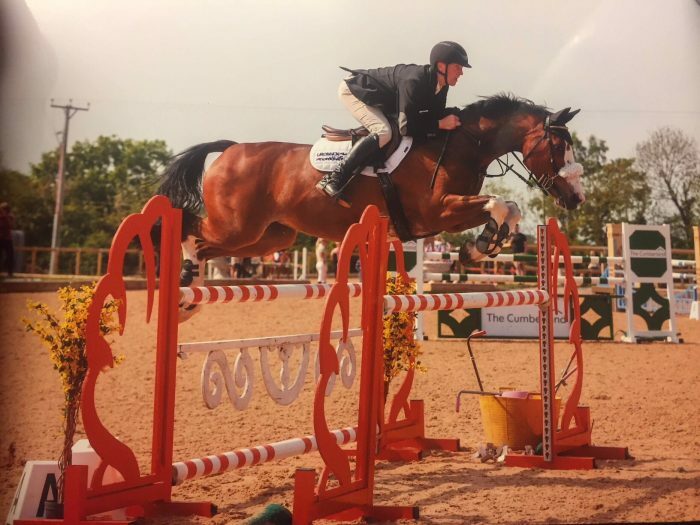 Most recently I travelled 3 hours south to the Tushingham Arena with 2 horses for the British Novice Regional Final trying to qualify for the National Champs in August. Both my horses are owned by Jane and David Steers and have only been BS registered since March. Both are very different horses, both in ability and temperament and it’s taken a while for us to click together, but they were fabulous at the regional. Both jumped a treble clear with Avalon V finishing 6th and Samson’s Hill finishing 7th which was incredible considering both their inexperience. So I’m already looking to June for the next part of the competition year with the Hickstead Derby meeting and plenty of other things to keep my fellow equines busy!